Apart from the obvious lifestyle and brain health benefits of being able to speak a second or third language, we believe that literacy in languages can also build high performing leaders and organisations. For leaders, learning a language is a very effective way of developing global literacies beyond just being able to communicate for a globalised world, intrinsically valuable as this is. For those of us lucky to have learned another language, we know that this has helped enhance a number of capacities essential to effective leadership. For example: Language learning enhances our perceptual capacities. The process of learning a language which is a cognitive, sensory, relational and context based activity, makes us better at inferring, better at being tuned to deeper, richer and more accurate meanings of what is spoken and indeed, unspoken and it makes us better at expressing ourselves. Language learning is sensitizing and this sharpens our social, relational, political and contextual antenna, vital for leadership in complexity. Language learning enhances our interpretive capacities. The process of learning a language is inherently concerned with understanding as making meaning. This requires the learner to actively listen, pay attention, understand context, to reflect, to question and to “suss things out’. This teaches us to be more aware of context, and more appreciative of how context impacts on real world thinking and real time behaviour. Language learning can help us to be more attuned to the “rules of the game” so that the ‘plays’ and the ‘players’ can be more effective. Language learning enhances our ability to empathise with the other. To realise that people have different mental models and that their logic and perspectives have a particular kind of ‘vocabulary’ and ‘grammar’. Empathy is perhaps one of the most important of all leadership and interpersonal skills. It underpins our emotional intelligence and enables effective, productive and supportive relationships, vital to the achievement of vision and goals. 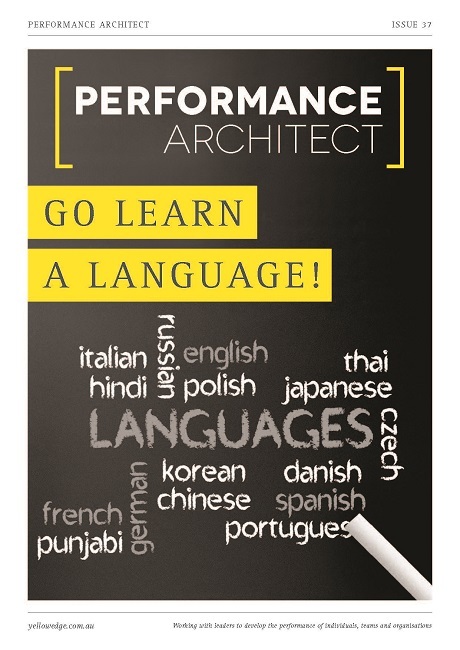 For people in organisations, the process of effective language learning can hardwire effective high performance habits. Language learning approaches used in the Rosetta Stone* methodology for example, provide learners with context specific tasks, scaffolding to accomplish those tasks successfully, immediate and constructive feedback, reinforcement of success and guidance for improvement. These are processes that underpin and can be applied to any desired high performance environment. Habits built through language learning can build positive habits in other areas of individual and organisational performance. Finally, language learning builds self efficacy, self directness and self-confidence amongst learners in the workplace. In today’s turbulent and ambiguous business context, having employees who are confident self-starters, who can take initiative, who can learn from mistakes, course correct and adapt to ambiguous, fluid situations can provide high performing organisations with a form of social capital that is hard to replicate or beat. Being able to speak another language is not just a lifestyle choice. In so many ways, it’s becoming a key competency for personal, professional, leadership and organisational success.